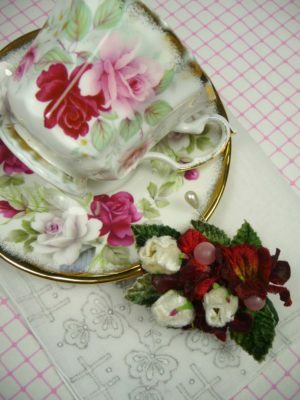 Vintage Christmas Corsages and Tea Cup Gift Sets ON SALE now! I know you are all busy looking for gifts for friends and loved ones on your “hard to shop for” list, so just wanted to send you a reminder about the Christmas Sale going on in my Etsy Shop, MEAICP. Vintage Christmas corsages make fantastic gifts for co-workers, neighbors, and all the ladies on your list – and there are only a few left this year. I also have a nice selection of really beautiful gift sets that include vintage tea cups with matching vintage hankies and mini corsages, all packaged together in a beautiful gift box – all now 25% off. Use coupon code BLOG10 at check out and you’ll get an additional 10% off! For all you last-minute shoppers, each set will be shipped via insured Priority mail, so you’ll have it quickly. Don’t miss this chance to pick up some great deals for all the vintage-loving ladies on your list! Thanks very much for reading my blog, and I hope you’ll take a few moments to click on my shop link and browse over some unique and affordable gift ideas!